The title of this episode is “Antipasto.” Translated into English this means ‘a first light dish prior to the formal meal.’ The literal Italian meaning is ‘before the meal.’ Of course, being the first of the season, this Hannibal opener is the light dish before we get into a meaty third season. “Bon soir,” Hannibal cheekily greets thé wife of the man he happens to be eating. Immediately, you know this will be an interesting little slice of an episode. Part of the whole entree of “Antipasto” is the fact we watch scenes between Hannibal (Mads Mikkelsen) and the disgraced Dr. Abel Gideon (Eddie Izzard) in flashback – Hannibal glazes bits of Gideon, prepares them beautifully, then dines with his prey on his prey. This dinner, for lack of a better word, serves as an opening course throughout this episode, which prepares us for something new and a whole awakening for the series as a whole. The conversation between Hannibal and Gideon is also significant. Especially when Gideon remarks, “I wonder what you taste like.” In every sense, we get to see the vulnerable side of Hannibal. He is now on the run. No longer just the hunter, Hannibal Lecter has become the hunted. Moments with Gideon, showing how Hannibal has been making him quite tasty for consumption, also give us insight (before we are full-on told) into the tenuous relationship between Hannibal and Dr. Bedelia Du Maurier (Gillian Anderson). Here in the beginning of Season Three, we move over to the phase of Thomas Harris’ novels which are mixed and matched for the series. Part of what we get in this season is out of Hannibal, part Red Dragon, and even some of Hannibal Rising. “Antipasto” begins to serve up part of the Hannibal novel where Lecter has shot off to Italy, after the events from The Silence of the Lambs when he is on the run. One my favourite parts about what Bryan Fuller has done (this episode co-written with Steve Lightfoot) overall with the series is that he does keep a lot of things familiar, yet the way he works things in and the adaptation of characters/events (et cetera) are really fresh. As a reader of the Harris books, I’m still surprised and always intrigued by some of the decisions Fuller makes in his adaptation. My favourite being how he has weaved the stories from both Red Dragon and Hannibal together and adapted the events to fit the story he has been telling, mainly the deep relationship formed between Will Graham (Hugh Dancy) and Hannibal. I love that Hannibal’s attempt at swiping Dr. Fell’s identity so easily is complicated. Those scenes are really great, and it also leads to more tension, more playfulness between Hannibal and his unwilling new wife, Dr. Bedelia Du Maurier. “What have you done, Hannibal?” asks Bedelia. 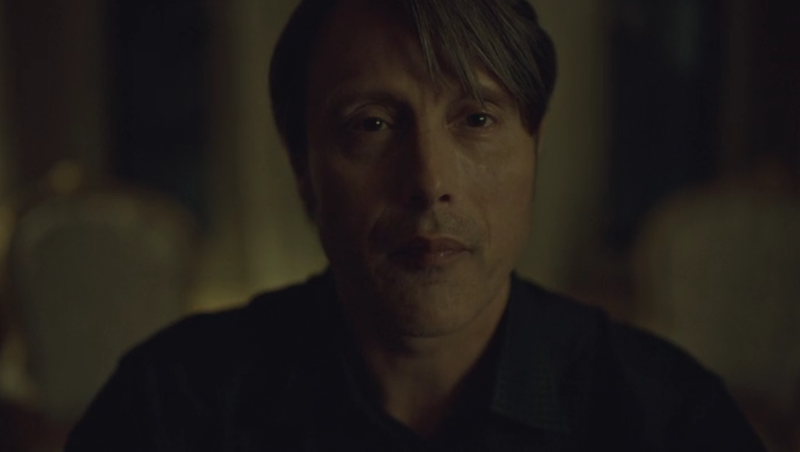 “I’ve taken off my person suit,” says Hannibal. I’ve always liked that ‘person suit’ idea because it describes Hannibal so perfectly. He isn’t human, he is not not human at the same time, but there’s no describing him. However, his attitude, his behaviour, it all fits the description of ‘person suit’. “Will Graham is not a suitable substitute for therapy,” Hannibal replies when Bedelia asks if Will is still alive. I like how Fuller has changed things up. In the novel Hannibal, Clarice Starling figures out how to narrow down where Hannibal is hiding by tracking purchases of the delicacies Lecter needs to have, things he craves, the finer foods and drinks and such. Here in this first episode, we see how Bedelia is picking up this stuff from the market. 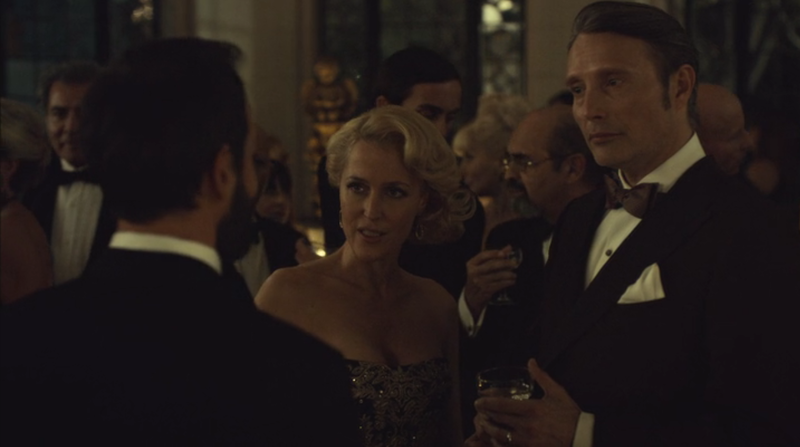 There’s a great shot of her on a grainy camera (much how Lecter was scene in the perfume shop in Ridley Scott’s Hannibal film adaptation), but Bedelia even looks right into the camera’s eye – almost as if she wants to be seen. Hmmm. Could Bedelia be plotting herself a way of getting out from under Hannibal’s wretched thumb? One of the things I like about the beginning to this season is the switch in perspective. Not that we hadn’t seen things from Hannibal’s side before, but now we’re seeing him in a position in which he’s never truly been. He has always had the upper hand. Now, he is wanted by every law enforcement agency in the U.S.A, plus international agencies, bounties, etc— everyone is looking for him. Yet he’s still slick, not letting anything phase him too much. It will get more and more interesting as the season moves on. Vincenzo Natali does a fantastic job with the season opener. There are great images here. 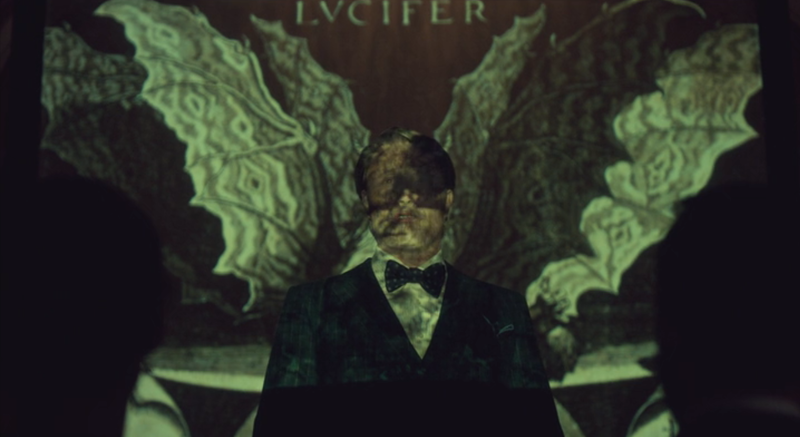 Particularly, there are two I love: one is a shot where Hannibal is lecturing and he stands in front of a projection screen with an old picture of Lucifer projected, right across his face, and Bedelia sees him almost as Satan himself. 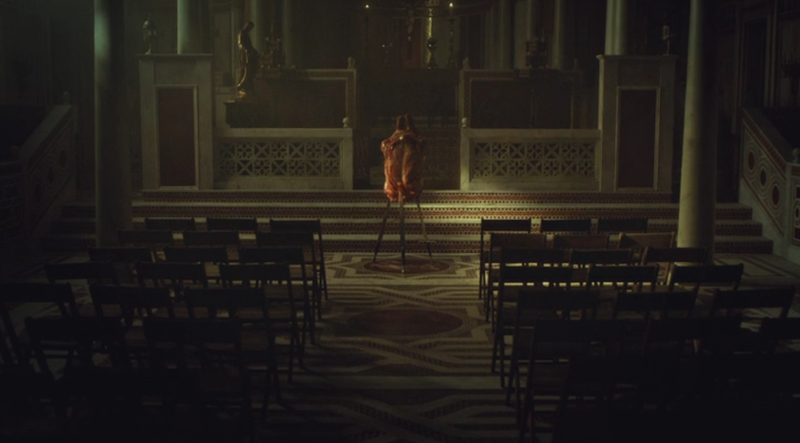 The other, a final shot of the episode where we see the shape of a heart, a big bloody corpse-like heart, and it’s clear Hannibal is sending out messages to someone – maybe Will? – that his heart is bleeding. The tension set up between Anthony Dimmond (Tom Wisdom), who knew the real Dr. Fell, and Hannibal is excellent. Automatically, Hannibal has to put another body on his rising count. Not that it really bothers him, he just turns up the heat again while it’s meant to be a period of hibernation, so to speak. Another great moment is when we see more of Bedelia and the patient who attacked her, exactly what went on with that whole situation. Pretty gruesome. Also, Zachary Quinto plays the patient, Neal Frank. That whole scene was revealing, and helped to flesh out the relationship between Bedelia and Hannibal. We start to see so much of how Bedelia is utterly lost, trapped in a situation she could never truly control, now she’s basically got to hold on tight and wait for the murderous, bloody ride to be over. Whether she survives or not, in the end, is a complete and separate story. 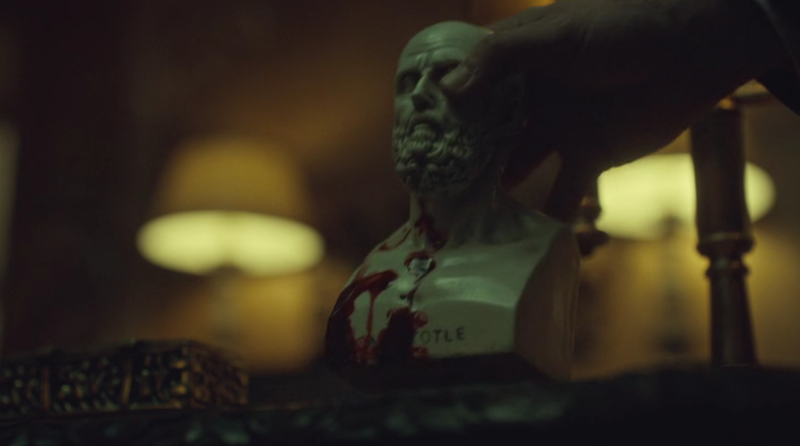 And, I couldn’t get enough of Hannibal cracking Dimmond over the head with that Artistotle bust, either. Classic, just perfect, too much so for words. This was a nice lead in for Season Three of Hannibal. We got some disturbing imagery, chilling and darkly comic scenes all rolled into one, plus we’re starting to get a different side of Hannibal Lecter now that he is no longer in the comfort of his own home, forced to roam Europe and fend for himself as best he can, all the while bringing Bedelia Du Maurier along for the ride. There’s a lot of snail imagery in this first episode – the sweetening of the meat, you might say – and it plays out through a lot of the following episodes this season. It’s a true shame NBC cancelled this series.